I don’t know what it is about fried chicken that makes it so special, but I know that it is. Maybe it’s because it carries with it a freight of history and emotion that’s all about comfort in hard times and celebration in good ones. Maybe it’s that it’s monolithic — its definition contained entirely within its name. 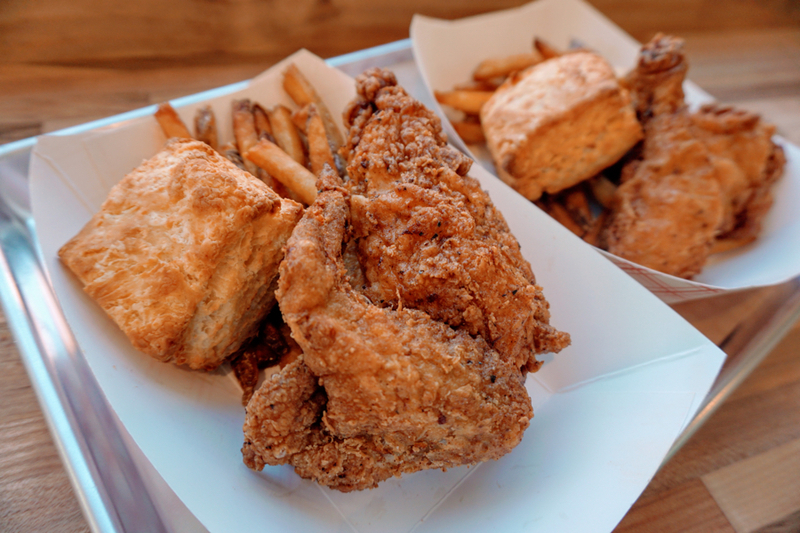 Order This: Fried chicken. As much as you can eat. Whatever it is, Redcrest’s chef, Adam Volk, seems to understand it. He comes to Philly from Brooklyn, where he’s (still) a chef-partner at one of the ’hood’s most happening comfort-food restaurants. He gets that fried chicken isn’t improved by its surroundings and thus has created a restaurant that’s little more than a glorified takeout counter with a few stools set along one wall. He understands that fried chicken isn’t dependent on flash or innovation, so he’s drafted a menu that circles eternally around the bird, the skin, the spice and the process. He does buttermilk fried chicken and a spicy version with a little bit of Thai chili bite. They’re greasy, but in the best possible way. Buttermilk biscuits on the side. Some hand-cut fries or creamy mashed potatoes with gravy. Volk does sauces. That’s his departure from the traditional. His point of innovation. Mostly, they’re for his sandwiches. He does four versions, all of them sloppy. You’ll get some on your face, but you won’t mind a bit, because they’re good. The garlic mayo and spicy full-length pickles on the buttermilk sandwich make it a winner. The Buffalo chicken sandwich is fantastic if you’ve got a couple drinks in you. Served on the side, Redcrest’s spicy honey sauce is nice with the plain fried chicken, and there’s a trashy, guilty pleasure to the ranch that I won’t even try to deny. Actually, that’s not a bad way to describe the entire place. The entire experience of Redcrest. What Volk has created is a neighborhood fried chicken shack right in the middle of one of the bougie-est restaurant neighborhoods in this city. It ain’t pretty. It ain’t classy. It certainly ain’t healthy. But it’s good. Which, really, is all it needs to be.